Although basketball fans will be looking forward to the FIBA World Cup this summer, taking place in Spain, sports fans have already witnessed one major World Cup this summer. The FIFA World Cup has already been held and Germany shocked many people by triumphing in the tournament, absolutely destroying host nation and sportsbook favourites Brazil in the semi-final. It is not as though Germany were the rank outsiders but there were a couple of teams tipped ahead of them. This may give some of the teams heading to the 2014 FIBA World Cup hope that shocks and upsets can occur, even on the biggest scale. This will not be good news for Team USA who are the clear favourites for the big event this summer. If the American team don’t live up to expectations, there will be shock, surprise and no doubt plenty of groans and grumbles about the team. You can see why Team USA would be looking to bring in experience and they may have got some insight into what it takes to win a World Cup. This is because German soccer Mesut Ozil, who plays his club football for Arsenal in London in the English Barclays Premier League, met up with Team USA during a training camp in Las Vegas. The German midfielder is still on holiday after the World Cup, and he is making the most of his spare time. His club players are already back at work, looking to build on finally winning their first pierce of silverware in close to a decade. Arsenal have badly underperformed in the last decade with many questioning the ability of manager Arsene Wenger to keep up with the big teams at the top of the league. The FA Cup triumph at Wembley in May finally gave the fans something to cheer about and it was the first trophy that Ozil got to lift over the summer. 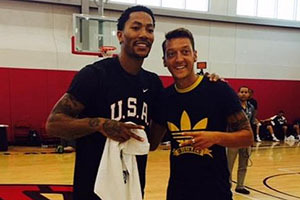 Ozil was pictures alongside Derrick Rose and Kevin Durant, the MVP of the NBA last season. Ozil also took to twitter to thank the players for spending time with him and wished them all the best for the upcoming event this summer. Given that Ozil is one of the big stars of European soccer, it is refreshing to see that he looks up to other athletes and was no doubt touched a little by stardust when he got to meet some of the top basketball players. Since the meeting with Ozil, Team USA has been rocked by the freak injury suffered by Paul George, and there will be some people wondering if the betting for the 2014 FIBA World Cup is running away from Team USA. The American squad still has more than enough quality to take gold in Spain but the campaign so far has been littered with injuries and drop-outs, making it far from the settled progression to Spain that many were hoping for. Of course, the success of Germany in Brazil in the summer shows that funny things can happen, and perhaps Team USA will be able to pull together and put on a unified show of strength. There is every chance the team will be determined to lift the FIBA World Cup as a tribute to Paul George, so this could actually be the making of the team. No matter what happens in Spain, you can guarantee that Mesut Ozil has had the best summer of his life!